Shipping charges can be added to any invoice (other than deposit invoices). In addition, expected shipping costs can be specified during order confirmation and the cost shown on order confirmation PDFs and pro-forma invoices. After clicking the edit (pencil) icon, you will be provided another screen where you can add the expected Shipping cost (net of tax) to show the order confirmation and proforma invoice. Tax will be applied to the shipping cost at the level set on the sale overall. 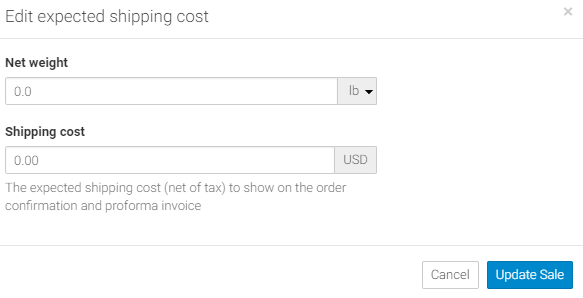 To add the shipping cost to an invoice, click on the edit icon (pencil in the top, right corner of the invoice) as shown in Figure 3. Invoices can be accessed from the Transaction Related Documents area of your Sales Orders or from the left, main vertical menu. Shipping charges cannot currently be included on order confirmations or pro-forma invoices. You add the shipping charges net of VAT/tax. 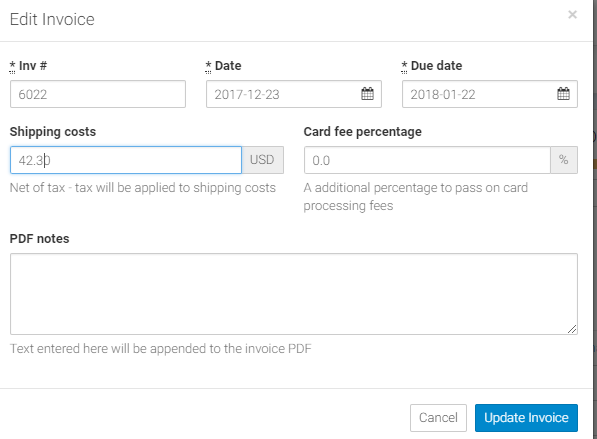 If you have linked your account with Xero or Quickbooks, you should add shipping charges to your invoice before pushing the invoice to Xero or Quickbooks.